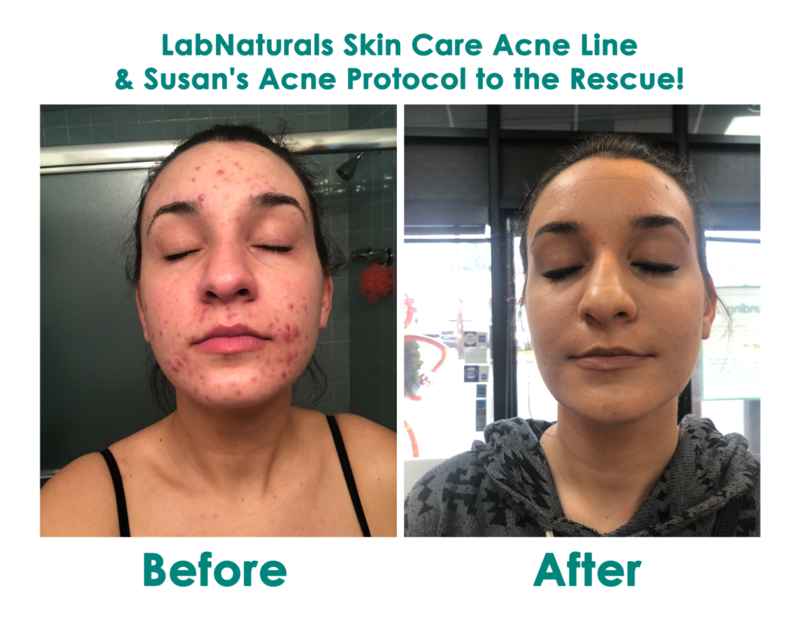 LabNaturals Skin Care Acne Line and Susan's Acne Protocol to the Rescue! Thank you for your amazing skin care...What a difference it has made! It also does a wonderful job keeping my skin looking its best. It was a cold and windy night. Earlier I had gone for a brisk walk which turned into a jog then sprint as the cold Pittsburgh wind blew right through me. Flash forward to about midnight. The skin on my legs felt very dry and itchy after the earlier exposure to wind and current exposure to heat from our furnace. My wife was asleep. I didn't want to wake her from the scratching but I had to find a way 'to put something on' my skin to quickly hydrate it or at least give me some relief from scratching. I reached for the first bottle of 'lotion' or whatever I could find. In the dark, using the flashlight app on my iPhone, I applied about a nickel size dab of a product labeled, 'LabNaturals Anti-Aging Body Lotion'. Let me tell you it provided instant relief. Less than ten seconds after I applied this stuff to my severely dry & itchy legs the entire dry appearance (and more importantly) the itchiness was gone. I don't even know if this product is designed to do that, but it sure worked and feels great. I can't wait till my wife wakes up in the morning so I can tell my wife of my miracle discovery, although she will probably tell me it was designed to do just that! Either way this stuff is amazing. I recently started using your Daytime Firming Peptide Lotion and Dreamy Night Cream...They are wonderful! I've had problems with my skin since I was a teenager. Antibiotics, birth control, over-the-counter and prescription solutions... You name it, I was on it to treat my acne. My last hope was accutane; however, with the extreme risks, I decided to not take the chances and just deal with the bumps and scars. It wasn't until Susan of Murray Avenue Apothecary introduced me to Lab Naturals that myself, and my friends, noticed a clear difference in my skin. I tried the full set- scrub, cleanser, lotion, spot treatment and toner. My favorite product of the group is the scrub. Not only does it make my skin feel smooth but I believe it's reduced the appearance of my scars. I use it everyday before applying make up. It's been almost 11 years since my first acne treatment and this is the first time that I can say I have little to no breakouts. I will never go back to anything else! To say that I love the Clear Skin Control and Clear Skin Toner would be a huge understatement...I have seen a huge improvement in just one week, so I am so excited to try more LabNaturals products. I love LabNaturals! I just started using it 5 days ago and immediately I could see and feel the difference. My skin feels tighter, my pores look smaller, and my acne doesn't seem to be acting up like it usually does. I LOVE LOVE LOVE your LabNaturals and especially the DREAMY night cream. WOW... I'm allergic to perfumes and everything I've tried is terrible... until this! You have a new faithful customer! No sagging - My eyes look refreshed. People say I look awakened. Ageless Glow is great in winter, and the Dreamy Night Cream really does work at night! LabNaturals Skin Care products are amazing - REALLY! My skin feels fresh and soft. Love the products! Great service. Will continue to order from you for as long as you carry them! Thank you! I have seen a huge improvement in just one week, so I am so excited to try more LabNaturals products. I tried the LabNaturals line of facial products. I love the Daytime Firming Peptide Lotion and the Vitamin C 20% Skin Serum and the Dreamy Night Cream, and last, the Eye & Lip Treatment. These products are wonderful - I have definitely noticed an improvement in my complexion. It's smooth and firm; the lines and wrinkles are less noticeable. I love the way my face feels. The products go on wonderfully without leaving my face greasy like the Mary Kay products did that I was using. They are all absorbed into my skin to do their job. The fragrance is nice and light too. I also tried the Refreshing Apple Cleanser. My face has never felt softer and cleaner. The Vitamin C 20% skin Serum, Eye & Lip Treatment, Daytime Firming Peptide Lotion, and Dreamy Night Cream absorb in beautifully. Love, love, love these products!